Ed Fraser Memorial Hospital in Macclenny, Fla., engaged BroadBased to create a 12-month integrated marketing plan that includes elements of broadcast television, radio, outdoor, online advertising, and a new social media presence. 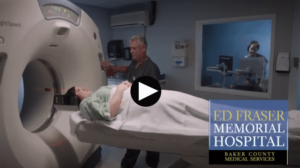 We teamed with CROP Creative Media in Jacksonville to produce a series of successful television and radio spots for the hospital, which is owned and operated by Baker County Medical Services (BCMS). But the element of the campaign that most surprised the client with its effectiveness was the social media component.